I’m driving to work. It’s September and the weather is kind of muggy already at 7am. Right before the light there’s an old abandoned village, or so it seems. This obscure place has become a resting place for a giant white oak that must have died a while ago, but fell not too long ago. I wondered if this tree was special to someone. On a recent woods walk, I took a photo of this slope. The gnarly old tree or snag probably caught my attention. But, when it came time to paint it the scene changed completely. First, I decided to put a stream through the middle of the painting. I felt the lighting needed a little jazzing up. The gray background in the photo might have been a bit bland for the painting. Never fear – the gnarly old tree made it into the scene! We end up with a somewhat moody little scene, depicting early morning, perhaps. I like the way the rocks on the top left came out. Rocks of Harriman State Park are typically that shade (from what I recall, anyway). It has a calming quality to it. Hope it calms you, the viewer too. ​This past September we had the good fortune of visiting Acadia National Park in Maine. Acadia is a wonderland of forests, granite peaks shaped by glacial events, and as depicted in this painting – rocky beaches. During our time on this rugged Atlantic coast, most days were very foggy and overcast, but rapidly changing, so I was inspired to paint a moody sky in transition. Toward the end of the timelapse, I also start to show some the kelp sprawled along the beach, which becomes a very prominent feature in the bay during low tide. I hope you enjoy part 1… I will post updates as the painting progresses! For many of us, the real sauce in a watercolor painting, any kind of painting, is direct experience. As I walk, the light bulb goes off, multiple times if I’m lucky. But, walk and be there I must in order to set the mind ablaze with ideas for a painting. It is a wonderful thing to suddenly be struck with excitement about re-creating, and maybe even embellishing the thing being experienced in real-time. It is one of the few things in life that doesn’t feel like pounding a square peg into a round hole; it happens with ease. I’m still playing around with these watercolor time-lapse ideas. This is the 2nd one I’ve done since the “Winter River Scene” from a trip to Connecticut early this year. 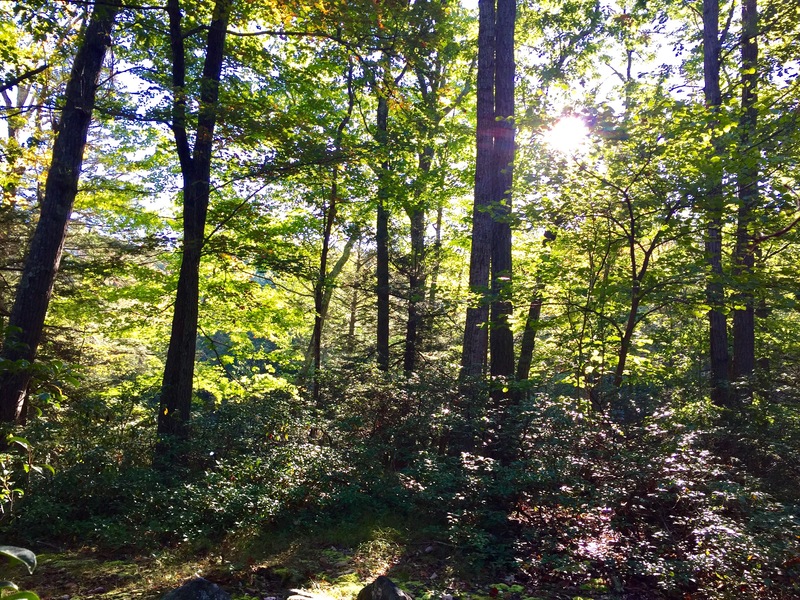 I’m fortunate to live close to Harriman State Park; a 47, 527 acre mixed deciduous forest, containing some of the oldest rocks in the world. The idea of showing the sun hitting this exposure of presumably Precambrian (1+ billion year old basement rock) is what sparked the inspiration for this painting. There were also two gnarly Eastern White Pine growing in this spot. Evidently, this type of pine is iconic of the type of ecosystem found in this region before European settlers began exploiting these giants for economic purposes, such as ship building, and it quickly became a major export. In this painting, I wanted to show the gnarly bark of a White Pine that is allowed to reach a certain maturity; reminiscent of a time when it reached old age regularly. To cap it off, there is autumn color to celebrate the season! Well, the sun has set on our 5-day Into the Sun blog series. Thank you, thank you. It has actually been more than 5 days; I have skipped some days and the reasons vary – rain, laziness, too much work at work. But, when I did write, I found this little exercise very refreshing. It has helped me use a different part of my brain (or use the brain differently) – that is, the act of writing creatively. And, it has definitely helped me to notice and celebrate the sun during this season of change. However, no matter how mindful we try to be; it is inevitable that we get swept away by a wave of confusion, anxiety, and haste. Maybe this wave is a byproduct of the society that we’ve created, I don’t know. But, if we can bring ourselves back to noticing things and get out of the funk every now and then – bravo! Lastly, I leave you with some fun facts about the sun (from https://space-facts.com/the-sun/). Cheers! The sun is not a perfect sphere. It is imperfect by just 10km between the poles and the equator. The sun is a yellow dwarf star (main-sequence G2V star). The sun is 4.6 billion years young. The sun is 70% Hydrogen, 28% Helium, and 2% other stuff. Our planet can fit inside the sun a million times. Hopefully, you are inspired to learn more about the sun or just to look up once in a while. The trail turns eastward and the walker, if walking early in the morning, is rewarded with an illuminated morning view of Boston Mine at Harriman State Park (NY). This old iron mine was last worked just before the 1800’s came to an end. With the sun shining so dramatically over this relic, the walker may be seduced for a closer look into the mine, as I was, but do beware of unsteady rocks and saturated ground within. Best to have a quick look and continue on sauntering. The sun and the mine working together to lure the walker in for a closer look! The sun is many things – a star, a giant sphere of energy and hot plasma, the center of our solar system. I also think of it as the star of aesthetics. It is the main ingredient to a beautiful landscape painting with a rustic old barn; if the direction of light is well represented it is likely a success. A light and dark side is key, but what about temperature and feel? The sun painted on the hillside or riverbank adds a feeling of warmth and comfort to the picture, and the viewer may unknowingly start to smile, as a result. Another rainy morning. Let’s enjoy a scene from Prospect Rock (along the Appalachian Trail); it suits the current climate!